This is the first time a special rose is named after a President. 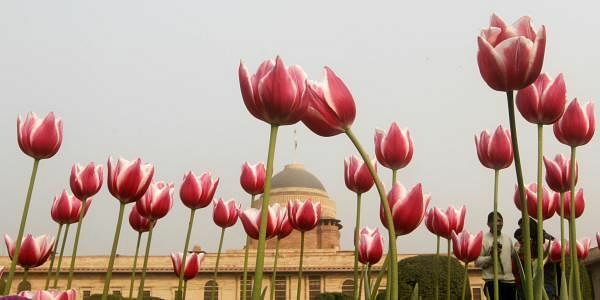 NEW DELHI: The famous Mughal Gardens of Rashtrapati Bhavan will this year have special roses named after President Pranab Mukherjee and his wife Suvra Mukherjee. This is the first time a special rose is named after a President. While the rose named after Mukherjee is yellow, the one in name of his wife is pink-purple. "For the first time, two new roses named after President Pranab Mukherjee and his wife late Suvra Mukherjee have been put on display. The special roses are developed by plant breeders from Pushpanjali rose nursery, Jakpur, West Bengal. The roses, which are on display in the main Mughal Gardens have not flowered yet but the authorities are hopeful they will bloom before the garden closes on March 12. Besides this, the other big highlights of 'Udyanotsav' 2017 are special theme-based exhibition of vertical garden forms and air purifying plants. With an aim to increase awareness about the benefits of air purifying plants, around 30 varieties of them including Banana, Dedrobium orchid, Weeping fig, Moth orchid, Red-edged Dracaena, Barberton daisy, Aloe Vera, English Ivy, Dwarf Date Palm among others, have been put on display in various sections across the gardens. A combination of flowering and other house plants has been used to inscribe words 'India' and 'Jai Hindi' on the walls of the gardens. Continuing the tradition of the previous years, a cactus corner with varieties of cactus and succulents has been arranged along with air purifying plants. There will also be an exhibition stall displaying organic fresh vegetables and fruits grown in the President's Estate organic farm. The dominant colour scheme for the all-time favourite tulips, roses and exotic flowers this year is yellow, red and orange. This time around 14,000 tulips are planted in the garden and are expected to bloom in phases up to March 5. Apart from the main Mughal Gardens, other gardens including Circular, Spiritual, Herbal, Bonsai and Cactus, Nakshatra, Musical and Tactile will also be open for public from February 5 to March 12 except on Mondays which are maintenance days between 9:30 AM and 4:00 PM. President Mukherjee will inaugurate the gardens tomorrow. Arrangements for drinking water, toilets, first aid/ medical facility and rest rooms for senior citizens, women and children will be provided. There will be special visiting days too as the gardens will open exclusively on March 10 for farmers, differently-abled persons, defence/paramilitary forces and Delhi Police personnel. They can visit the gardens on this day between 9:30 AM and 4:00 PM and the entry will be through Gate No 35. The Tactile garden will be open for visually impaired people on March 10 from 11:00 AM and 4:00 PM and the entry can be made from gate No 12.